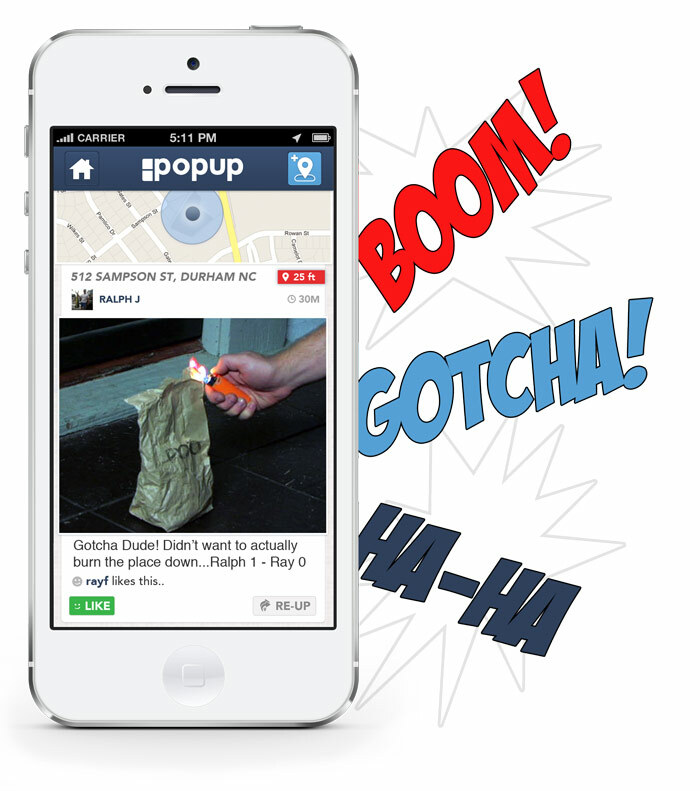 PopUp makes it easy to discover & leave nuggets of information at a location. Leave reviews, tips, jokes, or even reminders at places and they will popup when your followers arrive. 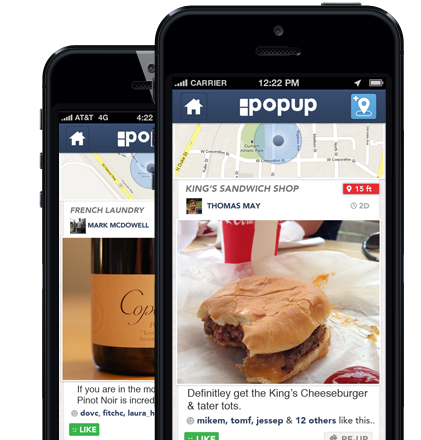 Follow friends and set their insights to popup at places for you. It's simple and serendipitous. Friends' tips and reviews are often helpful, yet more often lost or forgotten. She said to get which red wine...? I know he said one of the deserts was to die for, I just can't remember which one. 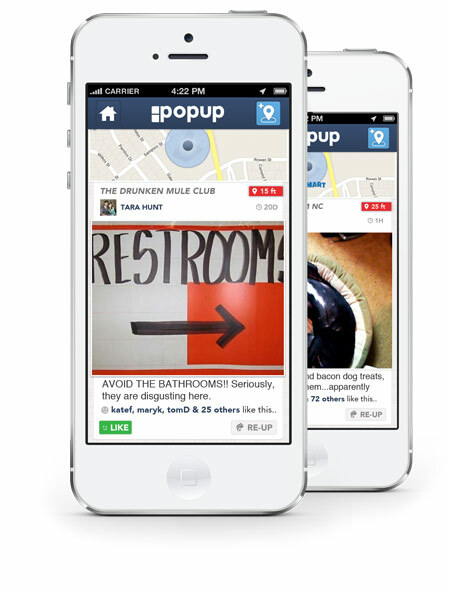 Use PopUp with your friends to share & discover tips and reviews at the places where they matter. What next, flying pigs? 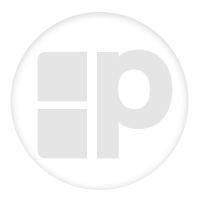 Be in the know about upcoming events, new items or coming changes. 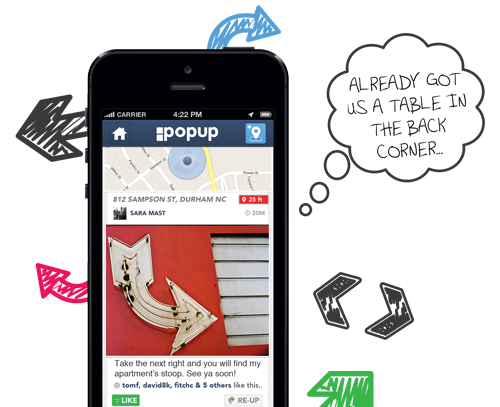 Follow your favorite local shops on PopUp and get their updates when you are there. Think of it as the digital cork-board for your favorite shops with much less mess. Reminders are only as good as where you leave them, so start leaving them where they apply. 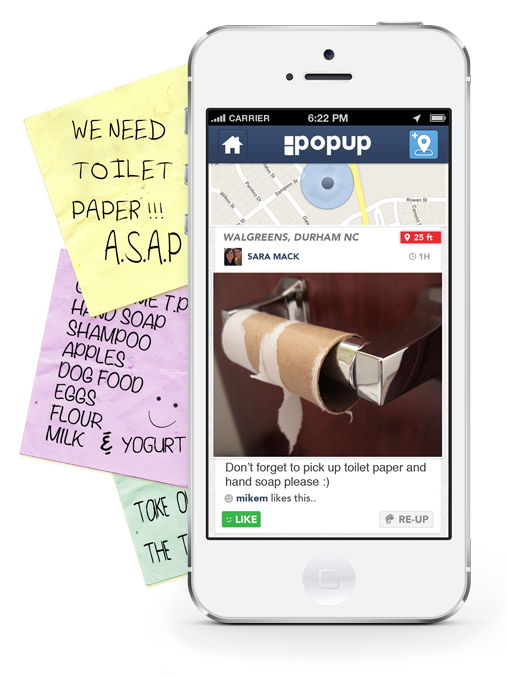 Use popup to leave reminders for friends, roommates, spouses or even yourself @ the places you need to be reminded. Think grocery lists @ grocery stores, chore lists at the house and meeting reminders @ work. All from the palm of your hand, no matter where you currently are. Turn by turn directions are a standard in navigation, why not in your daily life? Meeting someone for coffee? Leave a popup for when they walk in letting them know where you are sitting. Friends coming into town? Leave a popup on the corner, directing them down the easiest route to your apartment. "Steer clear of the bathroom, it looks like a medieval torture dungeon." Or "Don't miss out on the hidden coffee bar through the back door..." Life is much better when you can learn from others who have 'been there, done that.' No need to make the same mistake twice, or miss out on an insider's experience. Get suggestions from the people you follow, at the places they apply to. It sort of just makes sense, huh? You made it! You are a trooper. 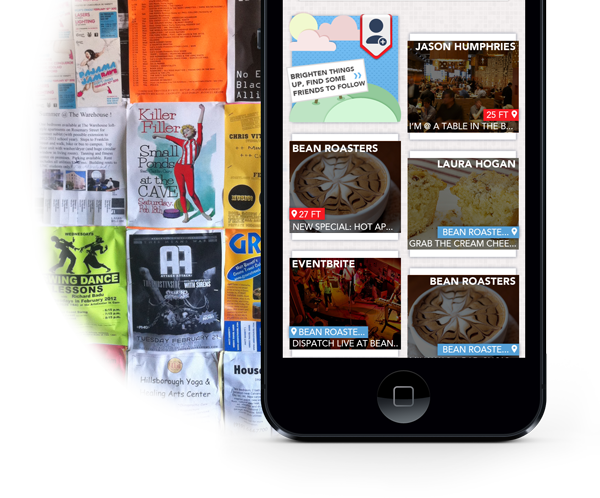 As a reward, here's the app we spent a year building...for free.